West Sacramento, Calif. - The Sacramento River Cats are proud to announce a special ticket package in celebration of Veterans Day. These Veterans Day ticket packages will only be available to former and active military personnel for two days and only on Thursday, November 8 and Friday, November 9 at the Round Table Pizza Ticket Office at Raley Field. 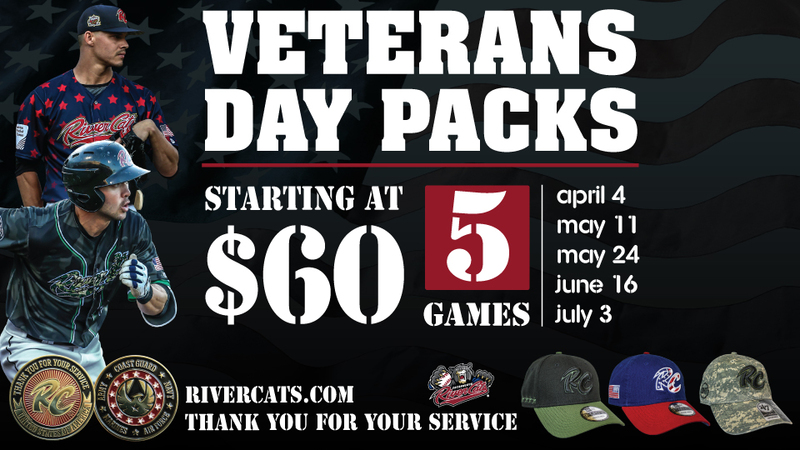 The package is available in both a Senate level option or an Assembly level option and includes five River Cats games for the 2019 season: Opening Night on April 4, Salute to Armed Forces on May 11, Orange Friday on May 24, Father's Day on June 16, and Independence Eve on July 3. In addition, each pack comes with either a River Cats-themed military challenge coin or a choice between three specialty River Cats caps. Prices for the ticket package are $60 for the Assembly seating option with challenge coin and $90 for Senate seating and cap. "The Sacramento River Cats would like to extend a sincere thank you to all former and active members of our Armed Forces for their service and sacrifice," said River Cats General Manager Chip Maxson. "The Sacramento region has strong military ties, ranging from Beale and Travis Air Force Bases, the US Coast Guard at McClellan, the California National Guard units, reservists, retired service members, and their families and friends. We want to do our part in recognizing these exemplary citizens, and are proud to always provide them with an outstanding baseball experience at Raley Field." This special package can be purchased by all former and active military personnel on Thursday, November 8, and Friday, November 9 at the Round Table Pizza Ticket Office at Raley Field. The ticket office will be open from 10:00 a.m. to 6:00 p.m. on both Thursday and Friday. Please be prepared to show Military ID or proof of service at time of purchase. For more information, please call the River Cats ticket hotline at (916) 371-HITS (4487), or email tickets@rivercats.com.